17-20 long pointed teeth on medial manus sucker rings of club. 14-18 quadraserial sucker rows on manus of club. Club large: 3/4 of contracted tentacle. Figure. Oral view of the tentacle of T. sagittatus. Drawing from Naef (1921-23). Figure. 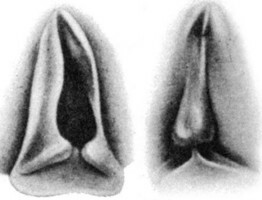 Frontal views of the funnel component (left) and mantle component (right) of the funnel/mantle locking-apparatus of T. sagittatus. Drawing from Pfeffer (1912). Figure. Side view of a juvenile T. sagittatus, 42 mm ML. Captured aboard the R/V G. O. SARS during the MARECO cruise. Photograph by R. Young. Habitat: The northeastern North Atlantac as far west as Greenland, where it is generally associated contnental slopes and seamounts of the Mid-Atlantic Ridge (Dunning and Wormuth, 1998), the Mediterranean Sea and along the western coast of Africa to about 13°S. A map of its distribution can be seen here.